Time: Saturday, September 29, 1:30 pm. - 5 pm. Members. This is a professionally judged event in all mediums with ribbons awarded in all categories. A Gala reception will be held to celebrate including the awards presentation. 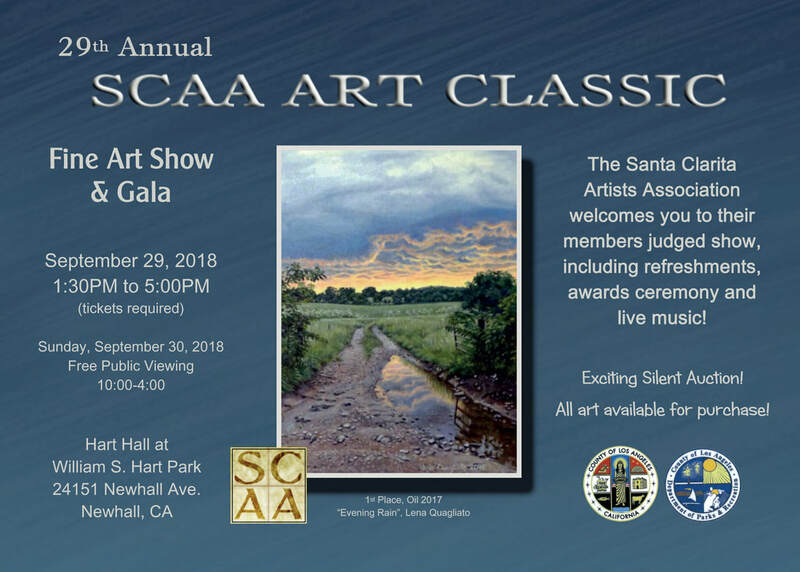 The SCAA “Art Classic” is also a fundraiser that supports the SCAA scholarship program and local art enrichment programs. All artist entrants will have free entry to the “Art Classic Gala” plus one free guest ticket. Additional tickets for the Gala may be purchased for $25 each. All artists are asked to sell 2 tickets. The Silent Auction at the Art Classic is a big part of our fundraiser. Please complete the attached silent auction form to add your donation. Small pieces of art, gift baskets, collectables, community donations sell well! Categories: The categories entered by the artist on the Entry Form are subject to change made by the Art Classic Committee. The Committee will determine the correct category for each piece. Changes made by the Committee are final. Awards: Best of Show, Gold, Silver, and Merit Awards in each category as determined by number of entries and judges scores. Master points: Best of Show + 4 points, Gold+ 3 points, Silver+ 2 points. No points are given for other awards. To become a master artist, an accumulated score of 8 points must be obtained from the Art Classic Fine Arts Competition starting in 2009. There is also an “Excellence In Art “ Award given by the City of Santa Clarita. Delivery of Artwork to Hart Hall , Thursday, September 27th, 4pm to 6pm. Delivery of all Silent Auction items to Hart Hall, Thursday, Sept. 27, 4pm to 6pm. October 15, SCAA meeting at Barnes and Noble 6:30 pm. All winners are requested to bring their winning art to the meeting to share with the membership. Questions: Please contact Dody Rogers, the Art Classic Chair,: 661 252-7639. The Entry Form with waiver Form and Silent Auction Form follow this page. The waiver statement must be signed to complete your application. As you begin preparing your entries for the Art Classic, it is important to know what types of work are acceptable for entry. The rules below pertain only to the Art Classic and not to the SCAA Gallery or other shows. SCAA has created and refined these rules throughout the history of the Art Classic to showcase our artists' work in the most equitable manner. We encourage all members to create and enter your finest art in the Art Classic! * Artworks must be the original creation of the artist. Your image CANNOT be derived from a photograph you did not take yourself. * The artist is NOT allowed to use a reference photo found on the internet, in magazines, or any publications. Artists cannot submit artwork made using a kit or painted/ created in a workshop or other classroom environment. * No incorporation of any clipart or any stock imagery into an artwork. * Artwork prepared in a classroom or workshop may not be entered. *The Artist needs to set up the lighting, subject matter, props, all on their own. * Think of your project as a solo art piece. It’s up to you to create your image for the Art Classic with your medium of choice. If discovered that the guidelines were not followed after the award was given then SCAA reserves the right to take the award from the Artist and the next member with the next highest points in that category will then be awarded that ribbon. In the event the Best of Show award is taken from an artist, the Art Classic Chair and Executive Officers will decide on the “Best of Show’ Award.